All pool table services include our exclusive lifetime warranty! Our exclusive lifetime warranty comes with every service. As long as we were the last to service the pool table you are covered. All Craftsmanship is Covered For Life! We Even Cover the FELT!! At Metro Billiards Service, we belive that pool tables are supposed to be fun and not problematic. This drives us to constantly perform at only the highest level the billiards industry has to offer. There are many things to consider in order to properly build a pool table. These will vary from one brand to the next. It is our responsibility to do every part of every job correctly giving our customers the freedom to enjoy the products that we have serviced in their home. "We want you to know that we do it right the first time!" A pool table's legs are the foundation of stability for the entire structure. Not only are they the only component in direct contact with the ground, they are also attached directly to the cabinet. 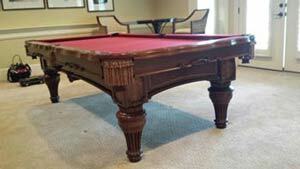 Improper installation of a pool table's legs can result in continuing difficulties maintaining true level. We warranty the leg's installation on your pool table, in both proper positioning and correctly fastened, to provide the highest level of stability for the brand and style of pool table you own. If at anytime the legs on your pool table begin to loosen, we will fix the problem free of charge. A pool table's cabinet can be manufactured utilizing different designs as well as being made of a number of different materials. This can vary for the style and manufacturer of the pool table you own. Regardless of the make, all components of the cabinet need to be fastened tightly and square to assist in proper slate installation and added overall stability. This is the foundation of the pool table's slate surface. We warranty the cabinet's installation on your pool table, in both hardware tightness and square, to provide the highest level of stability for the brand and style of pool table you own. If at anytime any component of the cabinet begin to loosen, we will fix the problem free of charge. The slate surface on a pool table is key to the quality of play. There are many things that need to be done correctly to make the surface play right. It has to be squared and fastened as tightly to the cabinet as possible while still being leveled and seamless. It also has to be meticulously cleaned of any debris that may become trapped under the pool table's felt. In addition to the surface being properly prepared, any backing that may be used to aid in the attachment of the felt must be prepared and cleaned as well. We warranty the slate's installation on your pool table. This includes the required cleaning of the slate's surface, cleaning any backing that may be used to aid in the attachment of the felt, proper leveling and tightness to the frame and seamless installation. If at anytime any component of the slate surface is found to be unsatisfactory, we will fix the problem free of charge. The rails on a pool table, like the slate, are also responsible for the quality of play. The rails need to be centered, squared, aligned and evenly tightened to the slate play surface. We warranty the correct installation of the rails on your pool table to be properly installed and remain tight and correctly aligned. If at anytime any part of the rails assembly becomes loose or out of alignment, we will fix the problem free of charge. The cushions on a pool table are vital to consistent play. They must be even in height off the play surface as well as having consistent make up to play correctly. When being replaced it is important to use quality materials as well as correct installation proceedures to the rails. In the event that we installed new cushions on your pool table, we warranty the correct installation giving proper rebound of the ball as well as a decade of consistent and quality play. If at anytime the cushions we installed on your pool table are found to be unsatisfactory, within a ten (10) year period from installation, we will fix the problem free of charge. Pockets on a pool table are designed to hold the balls when not being used in play. There are 2 general types of pockets that are used depending on the tables style. They must be attached to the rails and/or table tighly to preform properly throughout the life of your pool table. We will warranty the correct installation of the pockets on your pool table to remain tightly installed as well as being able to maintain their purpose. If at anytime the pockets become loose or do not not maintain their purpose, we will fix the problem free fo charge. The cloth surface of the pool table must be installed tightly and free of wrinkles to perform correctly. Cloth may consist of several different preformance types from tournament grade to those used for quality home play. We will warranty the correct, tight and wrinkle free installation of the billiard cloth on your pool table. We also support a full 7 year durability warranty for home use of any new billiard cloth that we install on your pool table. If at any time you find the installation of your cloth surface to unsatisfactory, we will fix the problem free of charge. The level of a pool table is obviously very important for quality play. Proper leveling of a pool table is a comprehensive process that requires attention throughout the entire assembly process. 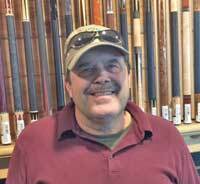 We will warranty all aspects of level on your pool table. This warranty includes settling that may happen when pool tables are placed above the foundation level or in newly build homes as well as any incorrect installation that may produce an off level condition. If at anytime your pool table becomes off level we will fix the problem free of charge. Regardless of the service that we are performing, we will bring any previously installed pool table, by another entity, up to our level of exceptance from the ground up so that it may be included in our Tru Table warranty. We will do this, at no additional charge, if the problems discovered can be fixed on site and not requiring an additional trip to complete the service required. If in our finding of any faulty installation processes, by another entity, are found that hamper this process, we will discuss the proper repair of those issues prior to the completion of the service. Additional charges may apply and will be discussed before they are carried out. Metro Billiards Service maintains the right to exclude any part of our Tru Table warranty that is a result of manufacturer defect, another company servicing a pool table that we have previously serviced or in the case of severe misuse and or abuse. These exclusions will be discussed while performing the requested service.